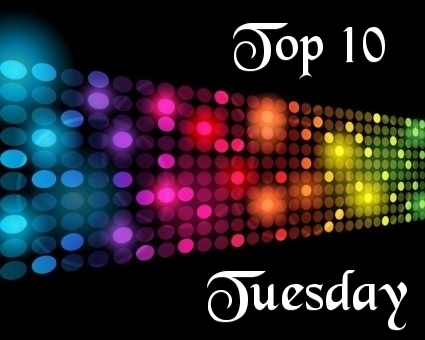 Tuesday means it’s another Top Ten Feature as hosted by The Broke and The Bookish. 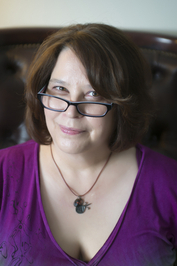 This week’s feature is the Top Ten Authors I’ve Read The Most Books From. I’ve taken these figures from Goodreads because they’re awesome enough to give us the details of who we’ve read most from. All images link back to their respective Goodreads page. As you can see, my top ten is a little bit mis-matched because there are several authors that I’ve read the same amount of books for. I’m also pretty sure that this list is a bit off because I’ve read more from these authors. First up is Laurell K. Hamilton with 38 books. I was extremely lucky to meet her on Friday 7th August for a book signing at Forbidden Planet in London. You can read my signing post here. I’ve got an additional 6-8 books to catch up on that should keep Laurell’s top spot. Second place goes to Sherrilyn Kenyon with 35 books. Again, I’ve been extremely lucky and had the opportunity to meet Sherrilyn a few years ago at a small independent bookstore in London. I’ve got about 10-12 books of Sherrilyn’s to read which might push her to first place. In third place is Nalini Singh with 29 books. I found Nalini Singh by accident one day and then promptly ordered the rest of her books and I have the entire Psy-Changeling series in both paperback and digital and the entire Guild-Hunter series in digital. I’m working on getting the paperbacks but I can’t seem to find the right dimensions. I do however, have another 2 or 3 of Nalini’s book that should keep her in third place for a little while. Fifth place goes to Michelle M. Pillow with 20 books. I’ve currently got an additional 8-10 books in my TBR pile so that might push her up to third place when I get round to reading them. 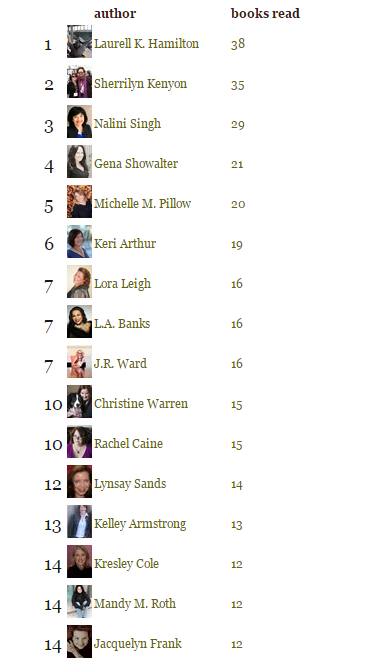 Sixth position on the above list shows Keri Arthur to be sixth, however, I know that I’ve read more than 16 books by J.R. Ward so I’m taking her up a few notches until I can sort out my Goodreads shelf properly. I’ve got about 3-4 books of the WARDen’s to read which will pus her up the list. 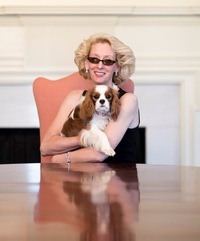 Seventh place belongs to Lora Leigh author of the Breeds series. I’ve racked up a 16 book total so far with an additional 4 that I still need to read which will push her up a few places. Eighth place is reserved for Rachel Caine with a current working total of 15 books that will change in the next few weeks when I finish off various series by here. I’ve got approximately 8 books to read. 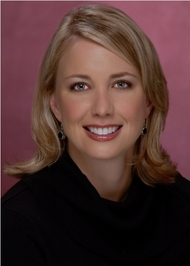 Ninth goes to Kelley Armstrong with a working total of 13 books (adamant that I’ve read more). I do however have an additional 6 books I haven’t yet got around to reading which will push her total up further. Tenth position goes to Kresley Cole with Goodreads totaling her books up to just 12 which is a lie seeing as I have about 16 books of hers on my shelf that I’ve read. I’ ve also got 5 or 6 of her books waiting in the wings to when I get around to it. Honestly, i don’t even know who most of these authors are :S Here’s my post https://ireadboooks.wordpress.com/2015/08/11/top-ten-authors-ive-read-the-most-books-from/ Happy reading!